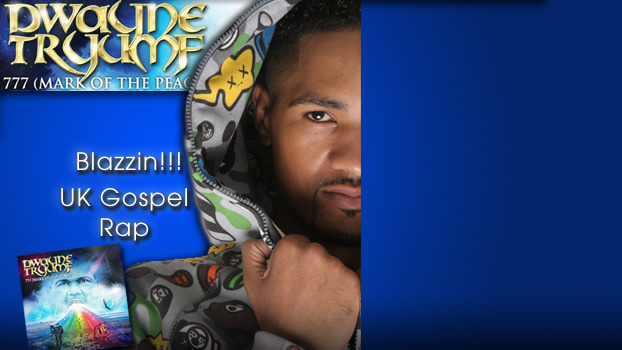 UK Gospel Rap Artist: Dwayne Tryumf, sings and raps this HOT track from his upcoming CD. The song: “I Don’t Pack A Matic” has been in large demand overseas. This is from the CD “THE MARK OF THE PEACE: THE E.P.”. If you are a new christian and are looking for uplifting music that will glorify God, check this out! This is also one of the hottest CD cover’s I’ve seen designed! Watch The Video! Watch This Extra Video Of Dwayne Tryumf’s interview with the UK News, as he speaks boldly for Christ. Born and raised in Clapham, London, Dwayne Shorter AKA Dwayne Tryumf has been involved in music production & rapping since ’97. His involvement with music began in a secular rap group called “Magic Circle”which featured UK artists such as Marga Man, Blackout, Chris Smoove and Don P (Pierre). He became a born again Christian in ’99 and his music took on a change in direction. From then on doors opened up for him and for him by way of collaborating with another member of his former group who also came to the faith. The two were known as ‘Dwayne & Wayne’ and during that time they began doing shows at many churches around London which gave Dwayne more stage experience. In 2000, he embarked on a solo career whilst working for UK based record label Jetstar records as an engineer / producer. In 2003 he was signed to Jetstar Records as an artist and producer and during this time he produced tracks with a number of reggae artists on the Jetstar label such as Lloyd Brown, Don Ricardo, Osmond Collins, reggae icon Greggory Isaacs, Savanah and also produced the smash hit “Incense Riddim” his first album ever released which sold 3000 copies in just 3 months and is still tearing up the dancehall since it’s release and has also crossed over to the Japanees market!